More than 1,000 players turned out to Grand Prix Los Angeles, but it was Goblins that shined in the city of angels. Red-Black Aggro entered the weekend as the deck to beat, and players spent all day trying to do just that – some with more than just this weekend's tournament on the line. From new play choices to the Player of the Year race, here are the moments that stood out from Day 1 of Grand Prix L.A.
Mark Herberholz is a name you may not have heard in recent years – at least not outside of the Pro Tour Hall of Fame conversation – but he’s one the more pivotal figures in the history of deckbuilding in Magic. With his renowned deckbuilding prowess and strong-but-not-slam-dunk resume, “Heezy” is often a topic of discussion in the Hall of Fame voting process every year. “When the Hall of Fame first started I was still on the Pro Tour – I had three Top 8s and I thought definitely going to get in because my career was still doing," he explained. “But it didn’t happen and eventually I was off the tour with a family and a full-time job. I saw people with resumes similar to my own getting in, and I thought that would be when I would make it. But it never happened." It didn’t, and as the years went by it became more and more frustrating. The frustration began to set in – what more did he have to do to convince voters? “I’m sympathetic to the fact my resume looks a lot like some of the other resumes, but I think it’s pretty telling the top players in the game when I was around wholeheartedly endorsed me and vote for me every year," explained Herberholz, who has been a vital part of the testing team over the years that saw people like Gabriel Nassif and Luis Scott-Vargas inducted into the Hall. In some ways, Herberholz may have been unlucky in the timing of his career. He came after the original greats of the game like Jon Finkel and Kai Budde that received most of the early attention, but before social media really took off – he vividly remembers a few years back checking the Twitter account of a recent Pro Tour winner and seeing that they had 10,000 followers; Herberholz has four Pro Tour Top 8s and a win, but he had just 300. The Hall of Fame voting process is heavily stat-based, but name recognition never hurts, and thanks to the time period in which he achieved his greatest success Herberholz lacked it. So Herberholz made a decision – if voters weren’t going to vote him on based on his current resume, he was going to add to it. That brought him to Grand Prix Los Angeles this weekend, where he was determined to make the most of the opportunity. He competed in the Friday Pro Tour Qualifier that also awarded byes to competitors in the Grand Prix, but he was realistic about his odds going in to the giant tournament. Odds are one thing – Pro Tour champions are another. Herberholz took his White-Blue Control deck all the way, winning the PTQ and in the blink of an eye putting himself back on the Pro Tour. 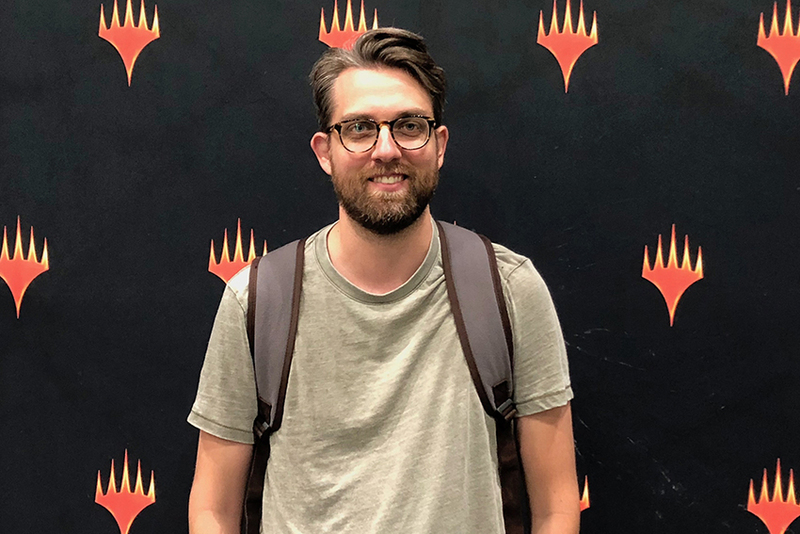 The result wasn’t completely out of left field – he had a hand in designing the Turbo Fog deck that took David Williams to fifth place at Pro Tour 25th Anniversary two weeks ago, making his way back into professional Magic the way he does best – through clever deckbuilding. Now Herberholz is back on the Pro Tour, and he’s determined to make the most of the opportunity. “To be honest, it’s 90% Hall of Fame and 10% just wanting to get back on the Pro Tour to play again," he said bluntly. “I’m aware enough to realize that maybe it’s some sour grapes that I haven’t gotten in yet. That’s just the reality of the situation, that I need another finish to push myself over the edge. “Heezy” will enter the next Pro Tour with a chip on his shoulder and plenty to prove – but you don’t become a Pro Tour winner without learning to play well under pressure, and Herberholz wants people to know he’s ready to get back to the top of the game. “The plan is to hook up with the old crew and get back to the old days of brewing," he explained. “I love the Hall of Fame conversation, and anyone who wants to talk about it can hit me up – and I’m coming back to put up another finish." For more than a month, Goblin Chainwhirler has terrorized Standard – the first-striking, board-wiping 3/3 for three has propelled red decks to the top of the metagame. And while there’s still plenty of Chainwhirler here in L.A., it seems its grip on Standard may be lessening. Of the undefeated players, just two were playing Chainwhirler decks, while Black-Green Constrictor saw a bit of a resurgence, along with a throwback White-Blue Auras brew. Just below the top of the standings were more interesting decks, including an Hour of Promise-fueled ramp deck that dipped into blue for Nexus of Fate, which is finding a home in more than just the Turbo Fog deck of Pro Tour fame. The list goes on. Players are finding ways to improve on Steel Leaf Stompy, dipping into other colors to complement the power of giant green monsters. One of the most successful variations came thanks to recently crowned platinum pro Andrew Baeckstrom, who added blue to the deck and even had some innovative sideboard tech in Metamorphic Alteration, which can turn a creature into the best or worst creature on the field, upgrading a mana dork or downsizing a Ghalta, Primal Hunger. While there are two tournaments this weekend – Grand Prix in L.A. and Providence – for a handful of players there is more on the line than just this weekend’s results. The race for Player of the Year is essentially a three-player heat between leader Seth Manfield and Reid Duke and Luis Salvatto, who are one and two points behind, respectively. There is some nuance to the number of pro points each can gain – each player gets to count the points from their six best GP finishes – and it’s Salvatto who best positioned there, with three one-point finishes on his tally, while Duke has a pair of two-point finishes at the bottom and Manfield’s lowest tally is three. Essentially, that means the bar is lower for Salvatto to make up ground than it is for either other player to distance themselves from him. 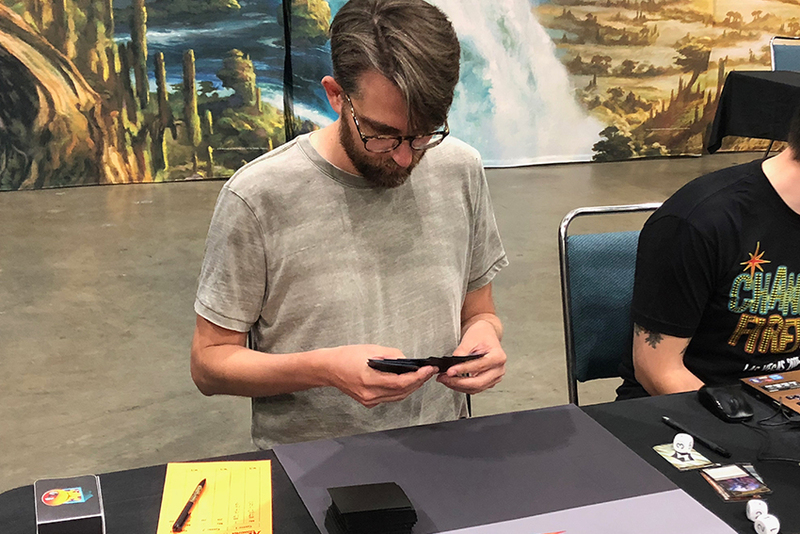 While Manfield and Duke competed in Providence – Duke failed to make Day 2 while Manfield went 7-1 – Salvatto chose to make a stand in L.A. in the first of a five-GP sprint that will determine the winner. “I actually thought that after the Pro Tour Seth had won, and I was just happy to have done as well as I did and make platinum," Salvatto explained midway through his 7-1 finish on Day 1 in L.A. “Then I found out it wasn’t over, and I realized I had a shot and an opportunity. My friends and girlfriend said I should try to get it, so I decided to go for it. This is a once-in-a-lifetime opportunity. Whoever wins Player of the Year, they deserve it." The goal for the next several events is a 12-3 finish or better, something Salvatto knows is ambitious but possible. “I’m just doing my best – you can’t stress about it because if you do you won’t play as well," he said of his mindset. “I want to be sure to thank my family, my friends and my girlfriend – you can’t travel the world for a month and go for this without support, and I have a lot of support at home." After eight rounds of play in L.A., seven players lead the way with umblemished records – Bradley Yoo, Reggie Renteria, Joseph Anadio, Eddie Caudill, Steven Solis, Mitchell Tamblyn and Edward Wimpenny. For a format that has been defined in recent months by Goblin Chainwhirler, its grip on Standard wasn’t all that strong in California. Represented among the undefeated decks were two Chainwhirler decks, two Steel Leaf Stompy, Grixis Midrange, a Black-Green Constrictor deck and a White-Blue Sram, Senior Edificer Auras brew. It was an unexpected finish for a still-changing Standard format, and it sets up for an exciting Sunday finish, which you can find at twitch.tv/magic.